Founder, Youth Film Platform and Film Village of Kenya. Film Biz Africa; Top 40 Women in Film in Africa. Rachael is filmmaker and social entrepreneur with 12 years of experience in the Audio – Visual industry in Kenya. She is passionate about impacting the society through film. Under the Youth Film Platform, she empowers 150 youths every year with practical and professional skills in multi-media for income generation and social self-expression through a hands on program in filmmaking and Citizen Journalism. The program has empowered over 800 students over the last 7 years across 7 counties. She is proud to have produced a breed of award winning alumna. Rachael has worked in partnership with the Kenyan Government, US Embassy Nairobi, Thriive, IREX, USIU and French Embassy in Nairobi among others. Under Film Village of Kenya, Rachael and her team are setting up a 300 –acre film studio which is expected to be the largest in Africa. 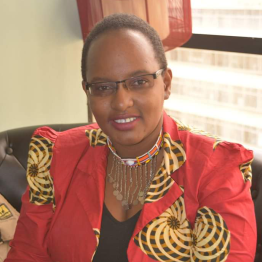 Professionally, she is a former TV news reporter KBC, Communications coordinator at Plan International Kenya, Lecturer, Shangtao Media Arts College, Production Manager- Princecam Media and has Produced/ Directed and crewed for many TV and films. Recently she produced and directed 5 short films and crewed for 16 others at the CinemadaMare Film Festival across 12 cities of Italy. empowers artist living with disability by enabling them to engage in building social projects like schools, churches etc. Rachael is also the Chief Juror of the ongoing 72hrs Film Series challenge; she is working together with an International Bench of Judges. Rachael has bagged various awards throughout the years including; Unsung Hero Award 2011- By US EMBASSY NAIROBI, Kiambu County Heroes Award 2013 during Kenya at 50 Celebrations, Top 40 Women in Film in Africa- By Film Biz Africa Magazine, 2014 Mandela Washington Fellow- By President Barrack Obama, GES Delegate 2015, Timeless Woman of Wonder 2016 by TWOW, 2016 Innovativeness in the County Award- Kenya National Gender Commission, Best Production in CinemadaMare Film Festival 2018 in Vasto, Italy. She has also attended Cannes Film Festival twice and Discop South Africa 2013.